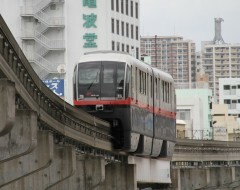 Yui-rail is Okinawa’s mono-rail line that runs from Naha Airport to Shuri as of now. The prefecture has decided to extend the line with another four stations north from Shuri. The northern end of the line will then be located in Urasoe City and the extension is scheduled to open for business in 2019. Okinawa hasn’t had any other rail system since the World War II, and Yui-rail provides an important transportation link on the island, especially for tourists, because Okinawa’s traffic jams are the worst in Japan.